In case you missed it – Black girls are winning right now! I mean let’s just start with the most recent news of Army Reserve officer Deshauna Barber winning the Miss USA 2016 title! Though I didn’t watch the show (I generally don’t), I was still very excited when I saw the news that a poised and intelligent black woman had won the competition. Hailing from the District of Columbia (D.C.) the 26-year-old IT analyst briefly took off her military uniform for a different one, beautiful gowns and now a sparkling crown to match. I tuned into some footage from the show and I immediately knew why she won. I didn’t play the race card or think, “Oh they picked her because it was the competition’s time to pick a black girl,” the way it generally happens every few years. But I felt in the few minutes of listening to Deshauna Barber answer questions and tell her story of coming from a military family but blazing her own trail for honor and respect, that she deserved to win. In my opinion it was refreshing to not only see a woman of color earn the crown but I honestly was surprised at what her career is, I thought it was cool. I didn’t expect such a young woman to be making positive waves in the military the way she is. I am not saying the other contestants didn’t have “cool” careers or that if Deshauna did something different it wouldn’t be as interesting, but I hardly ever hear of any WOMAN for that matter in the military that exuded such a positive aura. The #BlackGirlMagic trendy hashtag is not just a fun social media ploy for likes, but it really is becoming a virtual movement of sharing positive images and videos of the good stuff. As a black girl, I love it. Celebrating the good increases more to follow. This world we live in is crazy, it can be sad even painful. However, we as consumers and viewers of what happens around us have the capabilities to share power, not problems. I believe in the magic of black girls. Because I can! 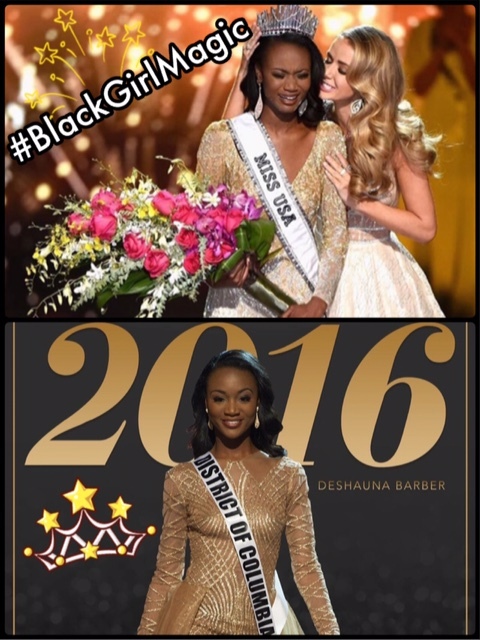 This entry was posted in Uncategorized and tagged Black Girl Magic, Deshauna Barber, Miss USA. Bookmark the permalink.